DAMASCUS, Syria - Islamic militants attempted to storm the US Embassy in Damascus on Tuesday using automatic rifles, hand grenades and at least one van rigged with explosives, the government said. Four people were killed in the brazen attack, including three of the assailants. A Chinese diplomat was also hit in the face by shrapnel and slightly injured while standing on top of a garage at the Chinese Embassy, China's government news agency said. Chinese Foreign Ministry spokesman Qin Gang said in a statement on the ministry's Website Tuesday that the diplomat, being treated in a local hospital, was in stable condition. No Americans were hurt, and the attackers apparently did not breach the high walls surrounding the embassy's white compound in the city's diplomatic neighborhood. But one of Syria's anti-terrorism forces was killed and at least 11 others were injured, the country's official news agency reported. The wounded including a police officer, two Iraqis and seven people employed at nearby technical workshop. A witness said one Syrian guard outside the embassy also was killed, but the government did not immediately confirm that. At the embassy in Damascus, as at most American embassies worldwide, a local guard force patrols outside the compound's walls while US Marine guards are mostly responsible for guarding classified documents and fighting off attackers inside the compound. Witnesses also said the gunmen tried to throw hand grenades into the embassy compound, shouting "Allah Akbar!" or "God is great!" It was not clear if any of the grenades made it over the walls, which are about 8 feet high. The attack came at a time of high tension between the United States and Syria over the recent Israeli-Hezbollah war in neighboring Lebanon. In Damascus the sentiment has become increasingly anti-American sentiment. Syria has seen previous attacks by Islamic militants. In June, Syrian anti-terrorism police fought Islamic militants near the Defense Ministry in a gunbattle that killed five people and wounded four. After Tuesday's attack, pools of blood lay splattered on the sidewalk outside the embassy, along with a burned car apparently used by the attackers. A sports utility vehicle with U.S. diplomatic tags had a bullet hole through its front window, and the glass windows of nearby guard houses also were shattered. There were conflicting reports of what happened. 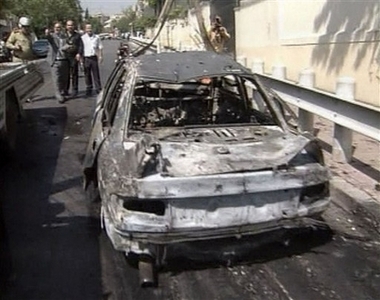 Syrian TV said one car was rigged with explosives but never was detonated by the attackers. But one witness said a second car did explode, and TV footage from the scene showed a burned car. The Syrian Interior Ministry, which is in charge of police, said a fourth attacker now in detention was wounded in the incident, which it called a "terrorist attack." The report, carried on state-run television, said anti-terror units brought "the situation under control" and an investigation was under way. In Washington, a State Department spokesman confirmed the attack by "unknown assailants" but had few details.